Don't miss this, friends! 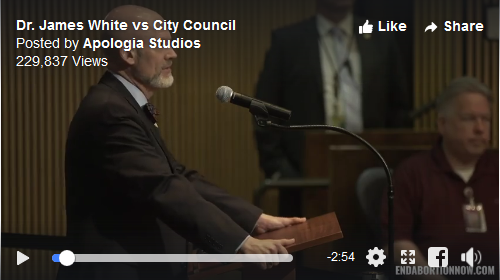 Dr. James R. White confronted the Phoenix City Council Chambers. You'll have to see this incredible story to believe it. “The reality is, within the borders of the city of Phoenix, more innocent children have been killed in equally gruesome ways than were ever killed in the Buchenwald concentration camp in the entire years that it was in operation,” White declared. His next question was simple: Who is going to stop it? “Will there be a General Patton who has to rise from the dead and force us to walk through the abortuaries?” he asked. How does God look upon the abortion epidemic? “I don’t think history is the most important thing,” White qualified.